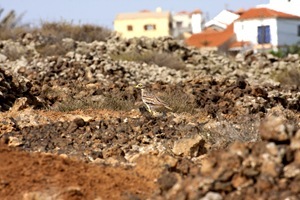 Stone Curlews in Fuerteventura! Always hard to spot, but a family (I counted eight in one go) took flight from a rocky field when startled by a dog who spotted them from a distance and mistook them possibly for chipmunks and began to give chase. When the dog saw flying chipmunks he gave up the chase straight away. No chance!! AND far too hot to run anyway. . 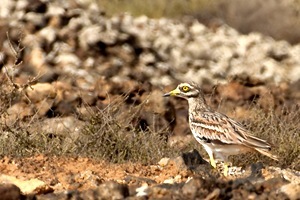 The Stone Curlews took flight from the dog, and landed again almost straight away, obviously not too alarmed by the dog once they saw what it was. They began to group together and then slowly made their way closer. Hiding behind one of the many stone walls, I slowly made my way closer and closer, snapping away. I think they were aware I was there but didn’t seem all that bothered by me as long as I made my way slowly and quietly. Eventually though I got that little bit too close and my feet made a little noise on the stony ground and they took flight, again just a short one. But just a little too far for my lens. 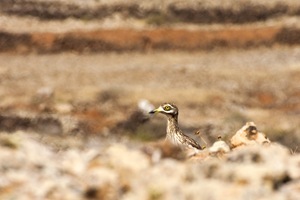 Like I said, Stone Curlews are hard to spot in the one above… very will camouflaged and only best spotted while they are moving. the moment they become stationary, the become virtually invisible.